Reference number for this case: 1-oct-54-Branges. Thank you for including this reference number in any correspondence with me regarding this case. Of revolutionary design, this saucer presents upside down in the shape of cupola with orange circle emitting a red gleam. Was observed within twenty meters by Mr. Gilbert Prudent, butcher. Michel Carrouges indicates that the Prudent observation was made at a distance of 50 meters. Oct. 01, 1954, 10:00 P.M., Branges, near Louhans (France). The author indicates that on October 1, 1954, a man who was returning at his place close to Branges in the evening saw on the edge of the road an illuminated object which had a flat section with a kind of "mushroom" at the top. When this man approached, the object became dark and flew away vertically with a soft whistle. Based on newspapers clippings and their personal file, the two ufologists indicate that a UFO landing took place in Branges in the department of the Saone-et-Loire on October 1, 1954 at 10:00 P.M.
An apprentice butcher had left his residence in La Chênerie to join the store of his boss, Raymond Bernard, in Branges. "I first believed that it was a car who had pulled up. At this time the engine of my motorcycle stopped. I saw this quite large apparatus take of vertically while producing a gentle whistling sound." The authors indicates that another person also saw the UFO. Jacques Vallée indicates that on October 1, 1954, at 10 p.m., Branges, near Louhans, the Saône-et-Loire, coming home, Gilbert Prudent saw a lighted object on the side of the road. It had a flat section and a sort of "mushroom" on top. As he approached it, the object became dark and took off vertically with a soft whistling sound. The two authors indicate that in Branges in the Saone-et-Loire, on October 1, 1954 at 10:00 p.m., returning at his place, Gilbert Prudent, butcher, saw a shining object on the edge of the road within 50 meters of him. The engine of his motorcycle stopped. The object had a punt part and a kind of mushroom at the top. While the witness approached, the object became dark and rose vertically with a weak whistling sound. The authors indicates that the sources are the Vallée catalogue, case 175; C. Grreau and R. Lavier in "Face aux ET" p. 46; Le Figaro for October 6, 1954; and France-Soir for October 8, 1954. At the same time as M. Dufix's experience, a M. Gilbert Prudent was driving near Louhan, France, when his headlights lit up a glowing mass parked on the shoulder of the road up ahead. As he closed the distance between him and the "glowing mass," M. Prudent could make out something of its shape. There appeared to be a "flat portion" and a "mushroom-shaped" section on top. Before his car could draw abreast of the thing, its glow dimmed and with a shrill, highpitched, sound, the thing launched itself vertically into the sky. 10. Rogerson, Peter. "The Catalogue." MUFOB New Series 2. March 1976. #36. p.7. Jean Sider indicates that on October 1, 1954 at 10:00 p.m. in Branges, Louhans, the Saone-and-Loire, Gilbert Prudent, butcher, saw an illuminated machine on the edge of the road at fifty meters of him, of flat shape surmounted by a mushroom. At this time his motorcycle stopped and then the object rose vertically. Jean Sider indicates that the source is Figuet page 105. Godelieve van Overmeire indicates that on October 1, 1954, in France, in Branges close to Louhans, "returning home at 10:00 p.m. Gilbert Prudent saw a shining object on the edge of the road at 50 m from of him. The engine of the cycle stopped. It had a punt part and a kind of mushroom at the top. As the witness approached the object became dark and rose vertically with a weak whistling sound." The sources are indicated as Jacques Vallée: "Chronique des apparitions ET" - DENOEL 1972 - COLL. J'AI LU - p. 264; M. FIGUET/ J.L. RUCHON: "Ovni, Premier dossier complet..." Alain Lefeuvre pub. 1979, p. 105. No. 5 ...the butcher a cylinder. Gilbert Prudent, a butcher of Res-de-Vemay (Saone-et-Loire) had the greatest fright of his life last Sept. 29. Coming home on his bicycle at 11:30 p.m., he saw on the road, 20 meters in front of him, a cylindrical (sic?) machine 4 or 5 meters long giving off a bright red light. (See his drawing) The young man came to a violent stop; the craft disappeared, with a slight hissing noise. 1954 - In Branges, near Louhans, France. While coming home at night, Gilbert Prudent and one other witness saw a lighted object on the side of the road. It had a flat section and a sort of large "mushroom" on top (domed disc). As he approached it, the object became dark and took off vertically with a soft whistling sound. (Sources: Jacques Vallee, Passport to Magonia, p. 214; Michel Figuet and Jean-Louis Ruchon, OVNI: Le premier dossier complet des rencontres rapprochees en France, p. 105). Jerome Beau indicates that on Friday October 1, 1954, "22 H in Branges, close to Louhans (France), Gilbert Prudent returns home when he sees 1 shining object on the edge of the road. It has a punt part and a kind of 'mushroom' at the top. Whereas the witness approaches, the object becomes dark and rises vertically with a weak whistling sound." The source is indicated as "Vallée, J., case #37, 'Rapport sur l'analyse de 200 observations documentées faites en 1954'". 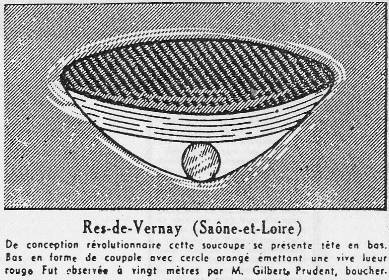 Luc Chastan indicates that in the Saone et Loire in Branges on 1 October 1954, "returning home at 22:00 the witness saw a shining object on the edge of the road at 50 m of him. The engine of the cycle stopped. It had a punt part and a kind of mushroom at the top. As the witness approached the object became dark and rose vertically with a weak whistle." The source is indicates as "Ovni, Premier dossier complet... by Figuet M./ Ruchon J.L. ** Alain Lefeuvre pub. 1979" and "Chroniques des apparitions E.T. by Vallée Jacques ** DENOEL 1972 - J'AI L coll." The website indicates that on 1 October 1954 at 22:00, in Branges, Anost, France, "Lighted object on side of road. It had a flat section, mushroom top. As he approached it, the object became dark and took off vertically with soft whirring sound." "An object was sighted that had an appearance and performance beyond the capability of known earthly aircraft. One domed disc was observed by one male witness on a road for ten minutes (Prudent). A whistling sound was heard." The sources are indicated as Bowen, Charles, The Humanoids: FSR Special Edition No. 1, FSR, London, 1966; Vallee, Jacques, Computerized Catalog (N = 3073); Vallee, Jacques, A Century of Landings (N = 923), (in JVallee04), Chicago, 1969; Schoenherr, Luis, Computerized Catalog (N = 3173); Rogerson, Peter, World-Wide Catalog of Type 1 Reports; Hatch, Larry, *U* computer database, Author, Redwood City, 2002. The website indicates that on 1 October 1954 at 22:00, in Branges, France, a "lighted object was seen on the side of the road. In Branges, near Louhans, France . While coming home at night, Gilbert Prudent and one other witness saw a lighted object on the side of the road. It had a flat section and a sort of large "mushroom" on top (domed disc). As he approached it, the object became dark and took off vertically with a soft whistling sound." "Coming home at night, Gilbert Prudent saw a lighted object on the side of the road. It had a flat section and a sort of "mushroom" on top. As he approached it, the object became dark and took off vertically with a soft whistling sound." "An unidentified object was sighted, but with appearance and behavior that most likely would have a conventional explanation. One star, about 5 feet across, was observed by one witness." *Oct. 1, 1954 - In Branges, near Louhans in Saone-et-Loire department, France. While coming home at night around 10:00 p.m., Gilbert Prudent and one other witness saw a lighted object on the side of the road. It had a flat section and a sort of large "mushroom" on top (domed disc). As he approached it, the object became dark and took off vertically with a soft whistling sound. (Sources: Jacques Vallee, Passport to Magonia: A Century of Landings, p. 214, case 175; Michel Figuet & Jean-Louis Ruchon, OVNI: Le premier dossier complet des rencontres rapprochees en France, p. 105). [---] Article in the national newspaper Le Figaro, Paris, France, 6 octobre 1954. [---] Article in the national newspaper France-Soir, Paris, France, 8 octobre 1954. [gl1] "Face aux Extra-Terrestres", book by Charles Garreau and Raymond Lavier, Delarge publisher, J'ai Lu, France, pp 48-49, 1975. [---] ""The Catalogue", by Peter Rogerson, MUFOB New Series 2, U-K., #36, page 7, March 1976. [fr1] "OVNI, Premier Dossier Complet des Rencontres Rapprochées en France", book by Michel Figuet and Jean Louis Ruchon, Alain Lefeuvre publisher, France, pp 105-106, 1979. [---] "World-Wide Catalog of Type 1 Reports", compiled by Peter Rogerson, U-K..
1.0 Patrick Gross February 12, 2009 Conversion from HTML to XHTML Strict. First formal version. Additions [jv3], [go1], [jb1], [lc1], [ud1], [ud2]. 1.2 Patrick Gross October 1, 2014 Additions [ni1]. 1.3 Patrick Gross December 12, 2016 Additions [ld3], [lg1], [ub1]. 1.4 Patrick Gross December 12, 2016 Additions [lg3].